Quip, a $1 app from Addy Mobile, aims to let you send photos to your friends’ cell phones without counting against your MMS quota. Once you’ve purchased the app, you can send any number of free photo texts to any phone. A Picture’s Worth 1,000 Words: Send images to your friends’ mobile devices just like you’re sending an MMS with Quip. If you include text, the app adds it to the image. When you launch Quip, it immediately thrusts you into your iPhone’s camera mode to snap a photo. You can also choose an existing photo from your library. 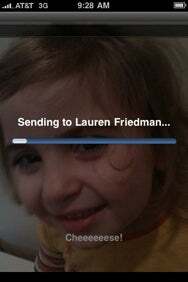 Oddly, though, Quip only supports the iPhone—the app is not available for iPod touch users, who could theoretically be ideal customers for sending photos from their libraries, since they can’t utilize MMS at all. Once you’ve taken a picture, you’re presented with a stylized version of the iPhone address book to choose your recipient. For some reason, Quip bizarrely tweaks the column of letters along the right side of your contacts, the one you can use to jump quickly to last names starting with a specific letter. Instead of showing all the letters, Quip shows bullets in between each, like “A • C • E.” It’s a weird choice, and one that’s especially frustrating when you’re quickly scanning for a letter that’s not there. 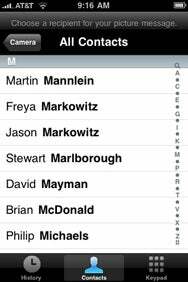 Every Other Letter: The A-to-Z navigation in Quip’s contact list is a little odd. I could find no way within Quip to save images that were sent to me, other than taking a screenshot. Any text that was attached to the image, of course, is saved with it. At a basic level, Quip works, in that it does send text messages with links to photos. But there are many weaknesses here: I have plenty of friends whose phones don’t have Web access, but who could receive MMS messages. Sending them photos with Quip is useless, since they can’t click the links to see the images. I appreciate the goal of saving me and my pals the cost of delivering MMS messages, but when an app is attempting to recreate a native iPhone experience, it should hew a bit closer to the original. The re-invented address book interface, missing auto-correction as you compose your message, and purported errors on successful message sending all belie a lack of attention to detail. While this app works, it’s a chore to use, particularly when compared to the built-in Messages app. I could go a bit easier on Quip if it were supported for the iPod touch crowd, offering functionality that they couldn’t get to any other way. But as an iPhone-only app, Quip just doesn’t fare well.